Beyond Veggie ('BV') is a concept restaurants by Secret Recipe, catering to modern vegetarian dining experience. BV menu focus on fresh and natural products without colouring, preservative and MSG. Although they already have more than 20 branches of BV in Malaysia, they only have one branch in Singapore, which located in Greenwood Avenue. While we were waiting for the rest of the group to come, I ordered Energiser Healthy Fruit Juice ($6.90) consist of orange and passion fruit. It is naturally refreshing with a hint of tanginess from the passion fruit. 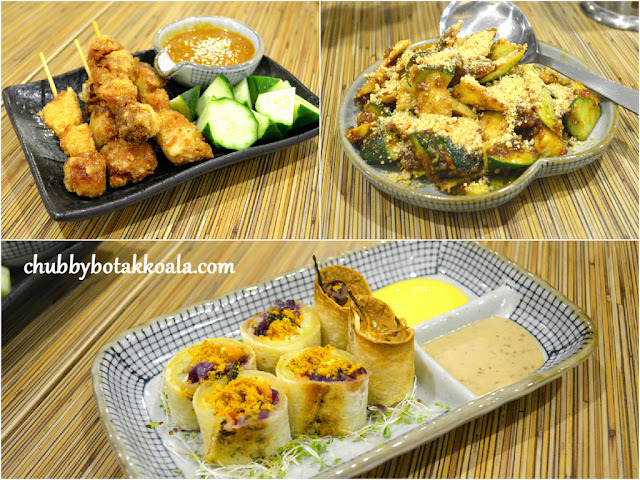 We started our tasting with Mushroom Satay ($7.90), Fruits Rojak ($7.90) and Veggie Roll ($7.90). The mushroom satay was deep fried, with crispiness externally while juicy and tender in the inside. The taste of the fried mushroom goes well with the satay sauce. The fruit rojak was fresh, coated with BV infamous vegetarian rojak sauce and surprisingly it tasted similar to the original prawn paste sauce. Veggie Roll is BV version of spring rolls, crispy and filled with pumpkin floss. Watch out for the added curry kick in the floss. Clockwise from Top Left: Mushroom Satay, Fruits Rojak and Veggie Roll. Fried Mushroom Salad ($7.90). This salad tasted clean and crisp. Comes with sesame dressing, it bonded the fresh texture with the crispy delicious fried mushroom well. I will not mind having this dish for my lunch on its own. For mains, Assam curd cutlets with assorted beans and eggplant ($14.90) and Hakka Village Tofu ($13.90). The assam dish has a nice balance between spicy, sour with a hint of sweetness from the pineapple. It is also fragrant due to the aromatic herbs such as lime leaf and torch ginger bud. The curd cutlets (fish replacement) did well to soak up all the flavours in the gravy. Yum Yum. Meanwhile this simple Hakka tofu dish packs us with many surprises. The beancurd is fermented, smooth and well fried, but the best part is the gravy. It might looked like a plain Jane but it is robust and packs of heat from the dried chilli just gives you the kick. A normal stir fried dishes at BV can be delightful as well. Stir fry French Beans with Minced Mushroom ($13.90). This normal Zhi Char staple was perfectly replicated in vegetarian version. The French Bean is fresh and crunchy, while the minced mushroom replicated the taste of dried shrimps. A simple yet wonderful dish. For Petai (stink beans) lovers, you might want to give this dish a try. Tempe Sambal Petai ($12.90). I can't comment on this dish as I totally do not touch Petai. Chubby Botak Koala, DIE DIE WILL NOT TOUCH!!! Fortune Yam Basket ($18.90). This dish is actually not in the original tasting menu, but I requested for it since I had good impression about this dish when I dine in BV KSL City. It is crisp with smooth texture of the yam inside. The fillings inside the basket consist of sweet pea, baby corn, carrot, black fungus, cashew nuts are just robust and tasty. The best part, the basket is not oily from the frying. For Yam lovers, a must try dish. For something fusion, we have Stir fry lion's mane mushroom ($15.90). Similar texture as salted egg dish, it uses English curry instead of regular Asian curry. The fried mushroom is light and crispy, and with the sauce it really goes well with the rice. If you are here for a quick meal, you can consider the individual meals from their Asian Wok, such as Assam Laksa, Beyond Veggie Fried Rice or Taiwanese “Nam Yue” fried vermicelli /mee hoon ($12.90 each). The Assam Laksa is the exact replica of Penang Assam Laksa without the meat ingredients. It is tangy and a bit spicy. A good awakening for the palate. Meanwhile the fried rice and fried bee hoon are accompanied by mushroom satay, ahcar and fried belinjo crackers. Though the taste are good, I find the price is a bit steep on this individual dishes. Of course, the dinner won't be complete without the desserts. 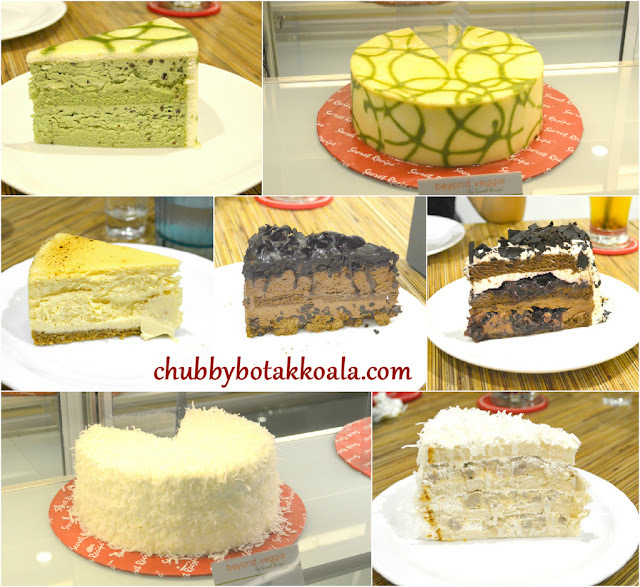 Each of the fresh cream cakes are priced at $6.50 per slice and $58 for whole. We tried Azuki Green Tea, Black Forrest, Ube Yam, Chilled Chocolate Cheese cake and The original cheesecake. My personal favourite is Ube Yam and Azuki Green Tea. The ube yam consist of 4 layer of yam sponge and 3 layer yam fillings convered with coconut flakes. It is soft, moist, well balance and delicious. While the Azuki Green tea is just a cream cake filled with matcha goodness. To accompany your meal here, I recommend you tried their Fruit Tea ($12.90 per pot). They have three version: Original, Passion Fruit and Lemongrass. They are served hot and enough for four persons. If you like yours cold, you can request for ice. The décor of this place is bright and simple Once you enter the restaurant, you can see the cake selections on display, which is already mouthwatering. Overall, Beyond Veggie provided a pretty good option for the meatless dining experience. It packs with flavour without using the preservative or MSG in their food. Definitely a place to consider for Vegetarian or even non-vegetarian like me. Cheers!! Thank you to HungryGoWhere and Beyond Veggie team for the dining invitation.